Timothy joined Impact Factory in May 2010 as a temp and immediately impressed with his conscientiousness, order and wisdom. In her role as Client Relations Manager, she looks after Management Training and Professional Development Programmes for our Corporate clients, Business Clients large and small, and an increasing number of Multi-national businesses. Natasha is an essential member of the business development team, managing client bookings and taking care of all the delegates who attend our open courses. Deborah became a part of Impact Factory in June 2011 as our part-time Office Manager. She brings her calm, order and organisational skills to the team, and exceptional skills they are. Paula looks after and develops the Impact Factory’s open course offering by maintaining and improving course content and enhancing the online avenues that support delegate learning. She also works to establish positive relationships with our L&D, HR and Training partners. Ana is strongly committed to Impact Factory mission to make the world a better place by building the confidence of the delegates who attend our courses. She is responsible for Impact Factory’s new value proposition, Go to Market strategy, Breakfast Tasters and audio-visual content. Andrea joined Impact Factory in October 2015 to support our expansion and offer a more dedicated financial support to our customers. Aimee is in charge of our training room layout, managing stock, dealing with room hire requests, maintaining our technical equipment and making sure it all works. 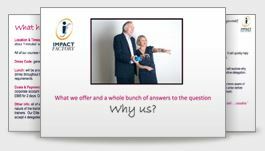 Meet the Impact Factory training team. Get in touch today to discuss your training needs.